All cities (all everywhere, in fact) have nearly-hidden assortments of monuments. Sometimes it takes a person with a niche interest, and possibly a good helping of spare time, to publish them all in one place. Here’s a quiz question: how many churches on Merseyside can you name which have pre-mid16th century origins? 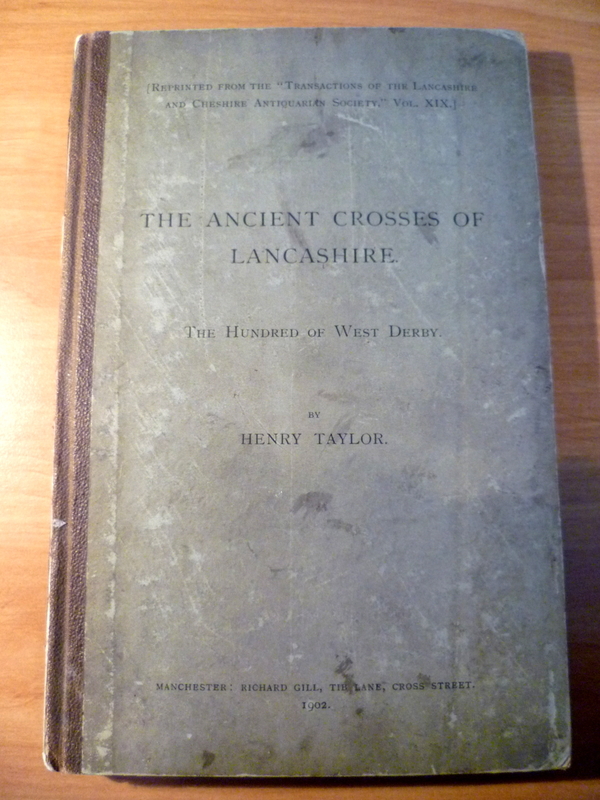 The Ancient Crosses of Lancashire by Henry Taylor (1902) is a small hardback book and a catalogue of hundreds of ‘ancient’ (read: historic) crosses as they stood at the beginning of the 20th century. It also answers questions like the one above. Its main feature is the countless number of entries describing all the crosses for which Taylor has managed to pull together evidence. A lot of this evidence comes from old maps and place names, but also anecdote – such and such a reverend mentioned it in a letter, passed via the local publican’s brother. The catalogue is divided into parishes, and covers the whole of the Hundred of West Derby. The book’s likely one from a multi-volume set; it covers just one part of Lancashire – the Hundred of West Derby. 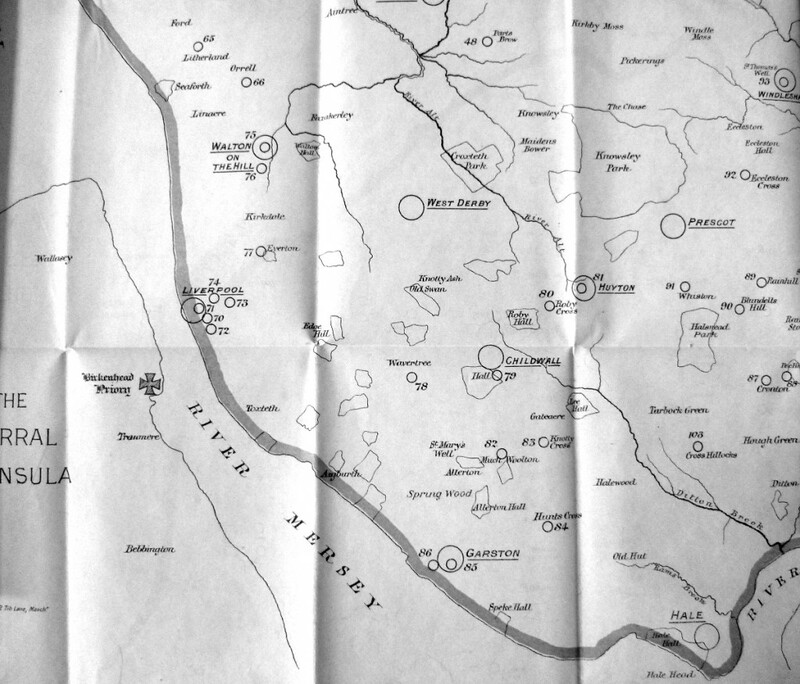 Before he gets to the catalogue, though, he goes through a brief description of the area, describing the West Derby Hundred as almost a ‘peninsula’, bordered as it is on three sides: Irish Sea to the west, Mersey to the south and Ribble to the north. He also notes the number (twenty) of ancient parks in the Hundred, which fits in well with our view of Liverpool itself as being blessed with a lot of open space. Some of that land originated in royal hunting parks (Croxteth, Toxteth) and some via other histories. 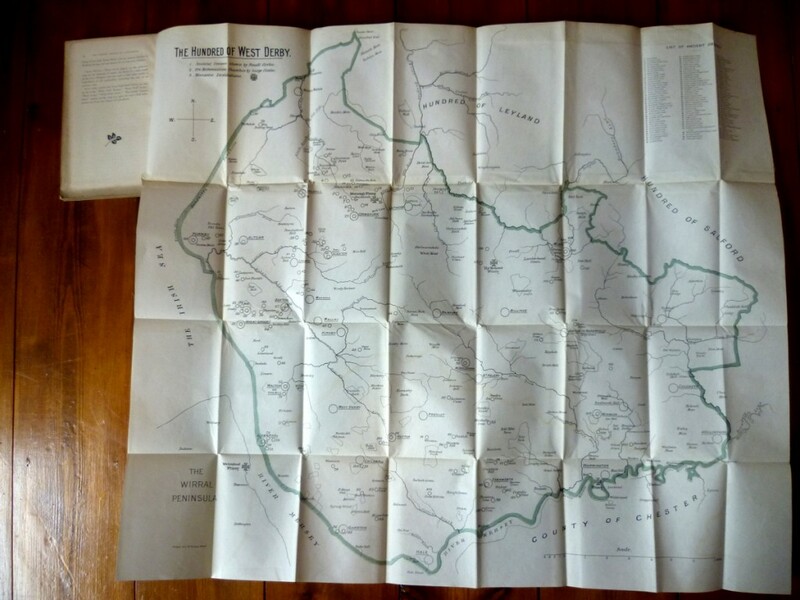 Ancient Crosses includes other little gems, like a handful of black and white photos of crosses, a map of Liverpool, and a giant fold-out map of the Hundred (see photo below). There are also lists of pre 16th century churches and chapels, and a list of wells in the area. This is a book by a man who’s interest (and knowledge) of the topic of religious paraphernalia is impressive. St Mary, Prescot; All Saints, Childwall; St Michael, Huyton; St. Mary, Walton-on-the-Hill; St Nicholas, Liverpool; St. Helen, Sefton; SS. Peter and Paul, Ormskirk; St Cuthbert, North Meols. So that’s 8 by my count. 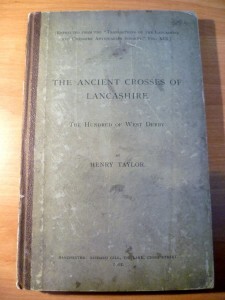 The following are all extracts from The Ancient Crosses of Lancashire: the hundred of West Derby by Henry Taylor (1902). The High Cross, at the junction of Castle Street, High Street, Water Street, and Dale Street. The White Cross, at the junction of Tithebarn Street, Oldhall Street, and Chapel Street. The Red Cross, at the junction of Castle Street with Red Cross Street. Towns-end Cross, at the junction of William Brown Street and Byrom Street, where the Technical Schools are now built. S. Patrick’s Cross, at the junction of Tithebarn Street, Vauxhall Road, Marybone, and Hatton Garden. The whole of these crosses have disappeared, but I give below all the information which I have been able to glean about them. The history if the “Red Cross” is involved in some obscurity. On the map of Liverpool already referred to in the year 1539, the “Red Cross” is distincly marked in the position described above. In Brookes History of Liverpool (published in 1853), the author states that a market for the sale of provisions, vegetables, butter, &t., was established early in the eighteenth century on the south side of S. George’s Church, where Alderman Tarleton afterwards erected an obelisk of red stone, which was called the “Red Cross” or “Tarleton’s Obelisk.” This fact, however, does not necessarily prove that a medieval cross did not stand on this site, for market crosses were rebuilt all over England many times over in the course of centuries. The same author states that the “High Cross,” which was known to have stood at the junction of Castle Street, Water Street, and Dale Street, at the middle of the sixteenth century, for butcher’s meat, fish, and vegetables, was removed in the years 1673 to make way for the new town hall. Mr. Brooke tells us that a portion of the ancient cross called the “White Cross” was in existence within the memory of persons recently living, close to where the “White Cross” Market used to be held, and that the remains of “S. Patrick’s Cross” were not removed until a few years after the year 1775. In an interesting article on “Lancashire Hearth Taxes” (Transactions of the Hsitoric Society, Lancashire and Cheshire, 1900) Mr. W. Ferguson Irvine says: “In 1701, the Earl of Macclesfield, who has superseded Lord Molyneux as constable of the castle, died, and the office, ins spite of Lord Molyneux’s claim to it as hereditary in his family, was given to Lord Rivers. The Corporation of Liverpool was at this time the tenant of the site…” One of the main objects of the application for the grant of the site of the castle was the scheme for making the new market there. The town suffered great inconvenience from the want of a proper market. the corn market was at the High Cross; the butchers occupied part of the area of the present exchange; the potato, shoe, and yarn market was at the White Cross, between Oldhall Street and High Street. Almost at the centre of the street [the ancient High Street], and close to the surface, lay three large blocks of yellow stone about three feet long, two wide, and one thick, much worn and damaged. These lay exactly on the spot where the White Cross is known to have stood, and though they cannot be said with certainty to have belonged to its base, their position and character are suggestive. *In Liverpool in the Reign of Charles II., by Sir Edward Moore, edited by W.F. Irvine, are several references to the various crosses and markets in the town, which would interest those who desire to follow up this subject; and similarly in The Moore Rental (Chetham Society, 1847). Liverpool was becoming at that time a place of some importance. As early as the reign of Henry II. its fishermen and traders had been incorporated, and in the time of Edward I. they were able to defray the expenses of sending two representatives to Parliament. In the reign of Edward III. the ancient chapel of St. Nicholas, an appurtenance of the Vicarage of Walton, was consecrated as a sanctuary, in and around which the inhabitants of the chapelry had the privilege of interring their dead…. Of the ecclesiastics residing near Liverpool the prior of Birkenhead was the most considerable. He claimed property in the ferry for carrying passengers and goods across the Mersey, and the monopoly of providing accommodation for them on his own side of the water…. The invention and general adoption of railways brought about an amazing change throughout the whole of the country towns of England. During the eighteenth century and at the beginning of the nineteenth the Lancashire and Cheshire gentry, when the weather became dreary in the autumn and winter, and the roads impassable,* moved for a time into their town houses in Manchester, Liverpool, Chester, Stockport, Preston, Lancaster, Ormskirk, and elsewhere. These towns were thus for a time the centres of social life, the market place and the market cross being places of resort for the discussion of foreign and domestic affairs. Note merely were punishments inflicted at the market cross, but “Notices” of every description were affixed to it. Thus, in Notes and Queries for January 12th 1901, we are informed that lists of those persons who took out certificates for hair powder (one guinea each) were to be fixed on the market cross and on the church or chapel. The ordnance maps show the sites or remains of no less than twenty ancient crosses in this part of Lancashire. Many have disappeared since the date of the 1848 survey. Some highly interesting notes by the Rev. 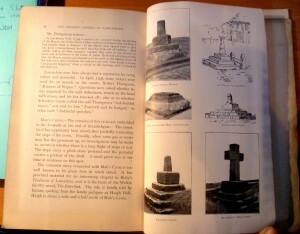 Austin Powell concerning the crosses of this district appear in the volume for 1887 of the Historic Society of Lancashire and Cheshire. This district (about ten miles from east to west and five from north to south) is a small oasis of old-world rural Lancashire hedged in by great manufacturing towns. The country is pretty and undulating, and contains several fine parks.